Polperro Dolphin Swims is a multi-award winning environmental tourism operation that offers you the opportunity to observe and swim with wild bottlenose dolphins in Port Phillip Bay, Victoria, Australia. Our fully licensed vessel possesses a professionally trained and experienced crew to ensure that you have an unforgettable marine adventure. Passenger safety and the dolphins’ protection are of paramount importance, and so we purposely limit the size of our trips to guarantee a high standard of customer and environmental care. Our on-board facilities include change areas, toilet and a galley for serving refreshments. 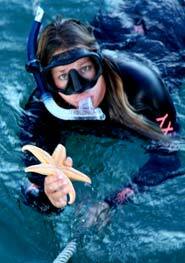 Wetsuits, masks and snorkels are all supplied. Reef and seal swims are often part of our trips, so be prepared to see and experience much more than just dolphins. Polperro Dolphin Swims offers a wide range of other services including Bay cruises, educational and historical tours, fully catered charters or a trip of your own personal design. 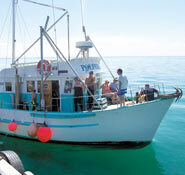 Polperro Dolphin Swims is owned and operated by the Muir family on the Mornington Peninsula. 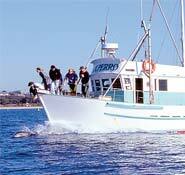 It was established in 1986 as the first commercial dolphin swim operation in Port Phillip Bay. It has since grown to become internationally recognised as a professional, innovative and successful business that conducts environmentally responsible dolphin interactions. All of Polperro’s crew possess recognised aquatic and first-aid qualifications, and are actively involved in environmental regulation and education campaigns to help ensure the long-term protection of Port Phillip Bay’s marine environment and dolphin population. They are a group of highly skilled professionals that are capable of delivering safe, responsible and memorable tourism experiences, and have earned a reputation as being one of the most knowledgeable and qualified crews working on the Bay. The Port Phillip Bay’s bottlenose dolphin are unique and protecting them is therefore of utmost importance. We have been active campaigners for marine national parks, regulatory reform, marine education and supporters of dolphin research as essential means of providing greater protection for the dolphins. We also embrace a range of strict environmentally-based business practices to minimise disturbance to both the dolphins and the marine environment. As a result we have been recognised and rewarded by winning the Environmental Tourism category for three consecutive years at the annual Victorian Tourism Awards and are now in the Victorian Tourism Hall of Fame.